Stitchin' Bints: Egg-citing sit and spin in North Norfolk? Would anyone like to come along to an 'egg-citing' 'sit and spin' session in North Norfolk on Sunday (4 April)? 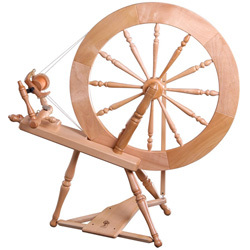 Bring a wheel or spindle (or needles or loom if you like) and drop in and out at whatever times suit you. There’s a cafe on site if you need more sustainance at lunchtime. Contact me if you're interested and I'll give you more details. Oh I don't want to spin ... I've tried and whilst I do it ok, I'd rather be knitting ... but I might be able to come and Knit (whoops freudian mistake Knit has capital because it is SO important)? If you'd like to bring your needles and sit and Knit you'll be more than welcome! It's Alby Crafts, on the main A140 half way between Aylsham and Cromer. NR11 7QE. Workshop 9 in the lower courtyard, anytime after about 11am. If it's not 20inch deep snow drifts, or lashing rain, or fearsomely large chunks of hail ... I'll be there! Don't you just love the weather at Easter, lol. Hopefully the roads will be OK. I took some photos this morning of daffs in the snow - amazing rare photo opportunity!